Home > Market News > I don’t know about you, but I’m feeling G20 too! I don’t know about you, but I’m feeling G20 too! Oil prices fluctuated between meager gains and steep losses yesterday, settling within a few cents of Monday’s closing price. So far, WTI has not broken below $50 during intra-day trading, although it’s come quite close. This morning, crude is trading slightly lower at $51.18, down 38 cents. Fuel is trading lower as well this morning in sympathy with crude, after light losses yesterday. Diesel prices are $1.8644, down 2.2 cents. Gasoline prices are at $1.4205, virtually flat to yesterday’s close. 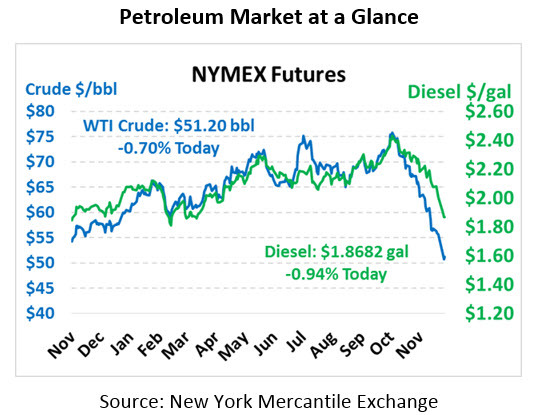 The API released their weekly inventory data, which showed a larger-than-expected crude build. 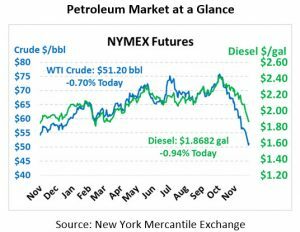 Both products surprised the market – gasoline’s surprise draw is particularly notable given how much excess gasoline stocks are in the market. The draw is limiting gasoline’s losses this morning, while diesel’s surprise build is causing somewhat steeper price declines. US-China Trade. Perhaps the single largest takeaway from the G20 meeting will be US-China trade policies. Trump and Chinese President Xi will discuss tariffs to see if they can come to a resolution. Traders are treating this week as the last major chance to avoid an all-out trade war between the two countries. Saudi/OPEC Production. The Saudis have committed to cutting production in December, and OPEC is considering a broader production cut in 2019. Trump has been nudging the group to keep pumping fuel to keep prices lower. Trump shielded Saudi Arabia from international backlash related to the death of Washington Post journalist Kashoggi, and he may call in an “I owe you” from Saudi Arabia in the form of lower oil prices. OPEC meets next week to discuss 2019 cuts.